mitral valve disease (MMVD) have evidence of disease progression. ECHO echocardiogram, LA:Ao left atrial-to-aortic ratio, LVIDD left ventricular internal diameter in diastole, LVIDDN normalised left ventricular internal diameter in diastole, TX treatment, VHS vertebral heart score. * The Cardiac Education Group is a group of ACVIM board-certified veterinary cardiologists from both academia and private practice in the United States that offers independent recommendations for the evaluation and treatment of canine and feline heart disease. † Dog breeds that commonly develop MMVD include Cavalier King Charles spaniels, dachshunds, miniature schnauzers, poodles, Yorkshire terriers, in addition to other pure and mixed breeds.4 ‡ Diagnostic imaging becomes especially meaningful in dogs when the murmur is no longer soft or focal. Imaging studies are always recommended for evaluation of a moderate to loud murmur of mitral regurgitation (grade 3/6 or louder). Echocardiography is also indicated if the cause of the heart murmur is in doubt, as with a younger dog who might have congenital heart disease or in a dog with a breed-risk for dilated cardiomyopathy. § A thorough history and physical examination should be performed at every visit. In addition to the presence of a loud murmur (3/6 or louder), factors such as the history of a cough, exercise intolerance, the loss of respiratory sinus arrhythmia, decreased appetite, breathlessness, and syncope have all been identified as independent indicators of disease progression. The more of these signs that develop, the greater the likelihood that significant disease progression has occurred.5 ll While both thoracic radiography and echocardiography can be used to identify cardiac enlargement, the echocardiogram is generally preferred if the cause of the systolic murmur is uncertain and to more precisely measure chamber sizes. If there is evidence of cardiomegaly/remodeling on the ECHO, then radiographs are also suggested to measure VHS, evaluate the cardiac chambers subjectively, and obtain a “baseline” for the appearance of pulmonary vasculature and parenchyma. In situations where the client declines echocardiography, the thoracic radiograph path can be followed in the primary care practice. 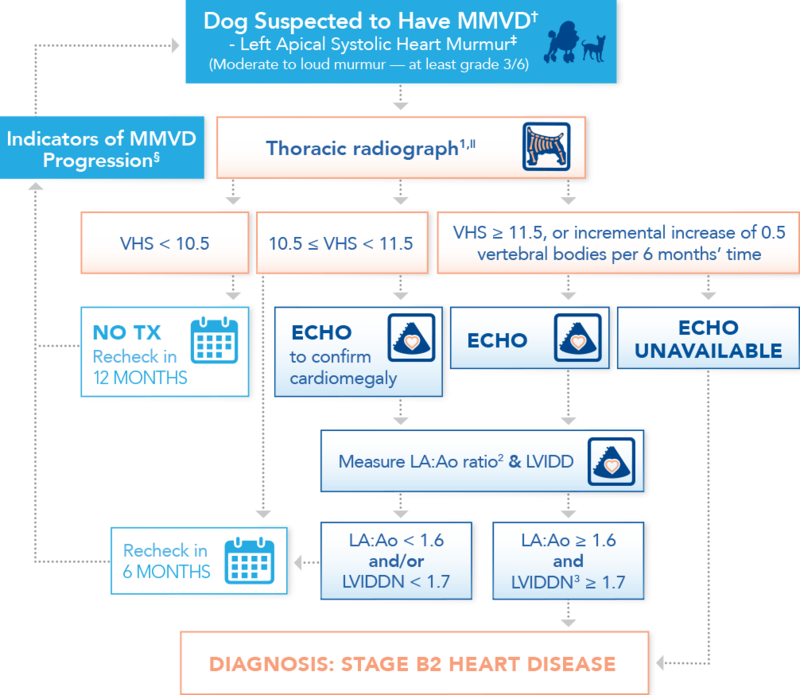 ACVIM guidelines actually recommend both imaging methods for optimal evaluation of a dog with suspected MMVD. References: 1. Moonarmart W, Boswood A, Luis Fuentes V, Brodbelt D, Souttar K, Elliott J. N-terminal pro B-type natriuretic peptide and left ventricular diameter independently predict mortality in dogs with mitral valve disease. J Small Anim Pract. 2010;51(2):84–96. 2. Hansson K, Häggström J, Kvart C, Lord P. Left atrial to aortic root indices using two-dimensional and M-mode echocardiography in Cavalier King Charles spaniels with and without left atrial enlargement. Vet Radiol Ultrasound. 2002 Nov-Dec;43(6):568–575. 3. Cornell CC, Kittleson MD, Della Torre P, et al. Allometric scaling of M-mode cardiac measurements in normal adult dogs. J Vet Intern Med. 2004;18(3):311–321. 4. Boswood A, Häggström J, Gordon SG, et al. Effect of pimobendan in dogs with preclinical myxomatous mitral valve disease and cardiomegaly: the EPIC Study - a randomized clinical trial. J Vet Intern Med. 2016;30(6):1765–1779. 5. López-Alvarez J, Elliott J, Pfeiffer D, et al. Clinical severity score system in dogs with degenerative mitral valve disease. J Vet Intern Med. 2015;29(2):575–581.